Running Bare Natural Hoofcare: What is Natural Hoof Care? Natural hoof care is the process of trimming and caring for your horse's feet using the wild horse as our model, rather than the manmade shoe. Wild horses need strong hooves to be able to outrun predators and search for forage over the roughest of terrain. They travel an average of 20 miles per day. Domesticated horses move very little compared to their wild cousins. They have been put in box stalls, small paddocks, and soft pastures, with their food provided at regular intervals. They really don't need to move much on a daily basis. With the "natural trim" we mimic the wild horse's natural sculpting process with more frequent trimming or rasping, instilling the angles and shape for which their anatomies were designed. This results in less concussion to the leg and more blood circulation, for an all-around healthier hoof. The hoof mechanism is meant to act as a hydraulic pump, or heart, to pump the blood throughout the hoof. Shoes inhibit this process. When shoes are put on a horse, the heels and sole are lifted off the ground, restricting the natural expansion and contraction process, thus reducing the optimal natural blood flow needed within the hoof for it to be healthy. Then, to add to this problem, nail holes weaken the hoof walls. Dirt and bacteria become trapped in the hoof, causing more instances of thrush. It has also been proven that the static vibration from metal shoes can cause conditions such as arthritis, ringbone, sidebone, and other tendon and joint issues over time. In icy or snowy climates, the shoe holds freezing temperatures in the hoof, further reducing blood flow as well as traction, and encouraging ice balls to form. Not only does the more infrequent farrier, or pasture trim affect the hoof itself by prompting it to crack, split or break off, it also affects the whole leg with ever-changing angles, and everything attached to it! This causes more stress to the horses' joints and their whole bodies. The natural, unshod hoof provides the best traction on any surface. Trail riders, barrel racers and many other disciplines of horse owners alike are beginning to recognize this. Also, with the dramatic improvement in horse hoof boots, which are now much easier to put on and keep on, the barefoot horse can get extra help when he needs it. The rest of the time, with periodic trimming, the hoof can be allowed to wear naturally. Natural hoof care practitioners are skilled in hoof anatomy, healthy horse movement and the natural trimming procedure, as well as the care we provide on a daily basis for our horses, and how it contributes to the overall health of the hooves. We understand a variety of normal and abnormal hoof conditions, and can suggest ways to improve or maintain your horse's natural hooves. How do we do this? 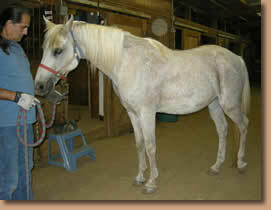 1) More frequent trimming and/or rasping to imitate the natural wearing of the hoof. The wild hoof rarely becomes overgrown. Domesticated horses are allowed to go six weeks or longer, which is usually well overgrown, if you consider that wild horses are constantly “rasping” their own feet. 2) Balance. This is one of the most important trimming points that appears to be missed. I frequently find horses extremely out of balance when I go on first time calls. 3) Trimming for lower heels and passive quarters. This helps the whole hoof to contact the ground. The natural shape of the hoof is for the quarters to be slightly scalloped, not actually flat on the ground, as in the average pasture trim. The natural trim allows the natural expansion and contraction process to take place, for better circulation. 4) The Mustang Roll. 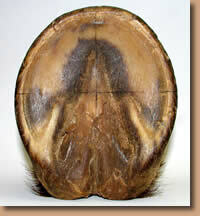 The wild horse hoof is naturally sculpted (worn down) with this roll, which makes for a strong hoof wall. It helps keep the hoof from splitting and cracking between trims in the domestic horse. 5) Natural breakover. The wild horse wears its feet naturally all the way around, with heel-toe action making a natural breakover. So, we as trimmers, go with the natural shape of the hoof. For certain pathologies, the hoof will reshape itself over time. Time, in conjunction with a proper trim, is the key element for "healing" the hoof. Taking your horse barefoot is just a matter of getting the right care and believing in giving it a try. Some horses can make the switch without the aid of hoof boots, although I recommend that you have them on hand. If they have been in shoes for a very long time, it will take a while to adjust to the new feel of their feet. But, you can ride right away on any terrain if you have hoof boots to help make the transition. I try to always have hoof boots on hand for your horse if needed, especially for laminitis, founder or navicular horses, as I never want to leave a horse uncomfortable. You may only need to use them as needed when riding on rough terrain that they are not accustomed to, so having them is a good idea so no riding time is ever lost. Hoof boots are now being used by riders in many different disciplines and types of footing, from eventing to barrel racing, as they are tough and long-wearing. I am a dealer for Easy Care, and I can help you choose the right type and style. I have seen hundreds of horses move and live more naturally and healthfully with natural hoof care. I'm convinced that if more owners took the time to learn about going barefoot and were open to trying it out, it would just make sense! Still, a good horse owner should always be skeptical of new procedures that affect an animal's health. You should be careful about whom you choose to do business with. There are excellent barefoot trimmers, and some that aren't so hot, just as there are good and bad farriers. Be sure to ask your trimmer where they received their training. They should be able to explain what they're doing and why as they work. Do your homework, as there is plenty of research and information about natural hoof care available (see some of my suggestions in Links.). Some horse owners who have become barefoot believers have used natural hoof care as a last resort, in the face of their horse having to be put down or retired to pasture due to various lameness problems. Many horses with hoof diseases such as navicular and founder, whose owners have tried natural hoof care, have seen amazing results. Horses that were deemed unusable are now being ridden again. While I can't guarantee that every horse will be healed, I have seen many successful cases in which owners were trying one last thing to heal their horses. Read it from them in Testimonies. My wish is to see more horse owners coming to natural trimmers, or farriers who are educated in this trimming technique, for a natural trim as part of their regular hoof care maintenance-before their horses get to this point. When I notice hoofprints on the ground, my wish would be to not to see the traditional horseshoe print, with only the shoe showing, but to see the whole hoof, frog and all. This is a healthy hoofprint on a healthy, happy horse!